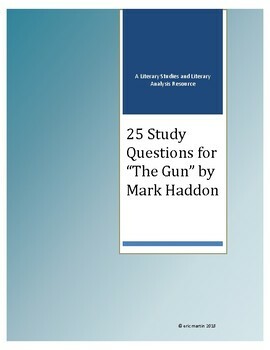 This resource is designed to facilitate in-depth literary analysis of Mark Haddon's 2013 short story, "The Gun" (an award-winning story from the author of The Curious Incident of the Dog in the Nighttime now being actively anthologized). The main component of the resource consists of 25 study questions that can be used for classroom discussion, assigned as homework questions, used for independent study or a combination of these. 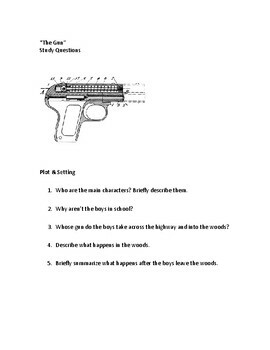 The questions model the literary analysis process, moving from comprehension questions about plot and setting to more interpretive questions that can be used as the basis for literary analysis essays. Used as a classroom resource for small group or class discussion, the study questions here should take about 90 minutes to complete, but that duration is flexible. Assigning the comprehension and character questions as pre-discussion homework, allows for a quick review of those questions and a more in-depth 40 minute class discussion of the remaining analysis questions. 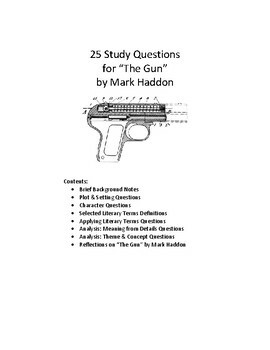 "Reflections on 'The Gun' by Mark Haddon."